NASA Earth Observatory image by Lauren Dauphin, using MODIS data from LANCE/EOSDIS Rapid Response. Story by Kathryn Hansen. Not all parts of the mountain range—one of the longest in the world—see equal amounts of the seasonal white stuff. The Andes span about 7,200 kilometers (4,500 miles) along the western side of South America, passing through multiple climate regions from dry to wet. 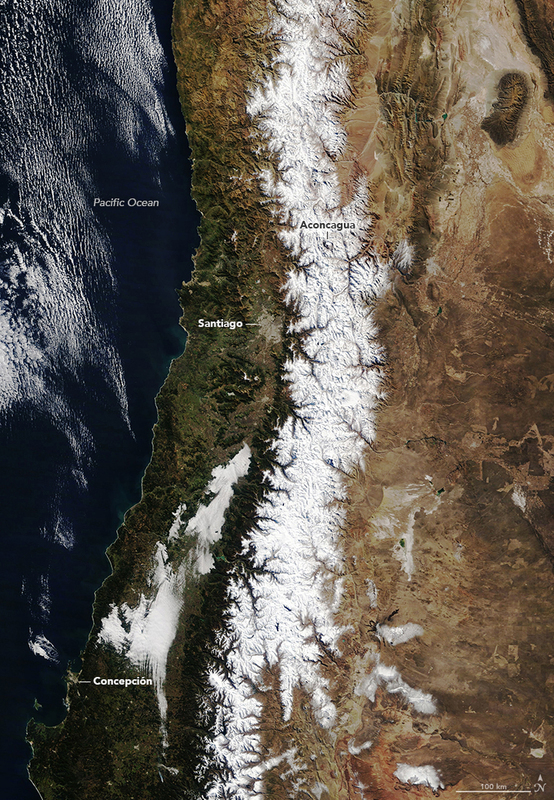 This image shows a part of the Andes in central Chile and Argentina that bridges the two climate zones. Research into snowfall patterns has found that the largest areas of snow cover have occurred in this central zone. Areas to the north tend to be limited by a drier climate, while areas to the south are limited by the range’s lower elevations. In this image you can see the Aconcagua, the highest mountain in the Southern Hemisphere, rising 6,962 meters (22,841 feet) above sea level. In this part of the range, the west side tends to receive more precipitation during austral winter, from June through August, when moist air from the Pacific Ocean is carried inland by westerly winds. But winter storms that pass through—including one in early August—can deliver enough snow to fully blanket glaciers on both sides. The snowpack that accumulates in the mountains is the primary source of water for communities at lower altitudes. Streams deliver the melt water to populated areas of central-western Argentina and central Chile, where it is particularly important for cities’ water supply, power generation, and agriculture. According to Gonzalo Barcaza of the General Water Directorate in Santiago, Chile, this winter has been drier than usual and follows nearly a decade of drought. Barcaza, G. et al. (2017) Glacier inventory and recent glacier variations in the Andes of Chile, South America. Annals of Glaciology, 58 (75pt2), 166–180. Minora, U. et al. (2015) 2008–2011 Snow Covered Area (SCA) Variability Over 18 Watershed of the Central Chile Through MODIS Data. Geogr. Fis. Dinam. Quat., 38 (2015), 169–174. 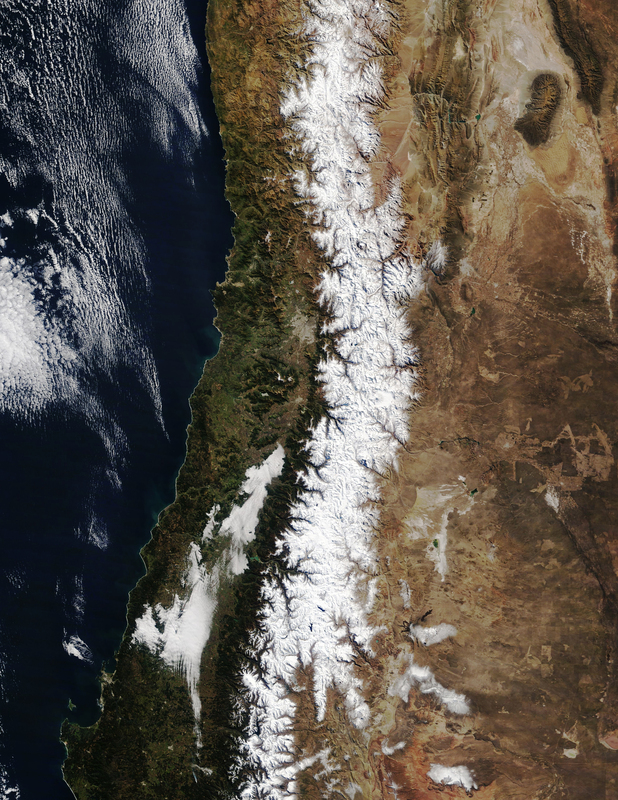 NASA Earth Observatory (2015, September 20) Snow in the Andes.